The Lonsdale dress and I have a shaky past. I originally encountered this pattern two years ago when I attempted to make a polka dot satin ball gown version. It was a disaster… too much drape and not enough fabric! Roisin had kindly sent me the pattern to trace and I felt like such a failure when I sent it back. I thought it was long overdue a revisit so I chose one of Minerva’s lovely stretch cottons and set to work. I picked this gorgeous vintage dark floral. This fabric works really nicely with this pattern in my opinion; just the right amount of body and there’s a great range of prints. I made the midi length skirt variation with no pockets. Sewaholic patterns are designed for pear shaped figures but I’m really not sure this skirt is the most flattering design on me. I feel like it emphasises the difference in size between my shoulders and hips, when I hoped I might appear more balanced out. It also uses a centre front seam which I absolutely detest. I think they interrupt the eye and distract you. I tried other skirts options like a circle and a gathered skirt but they just looked wrong! The main feature of this dress however is the halter ties. I think this is where my main issue lies. The ties look so pretty on others but they just seem to overwhelm my neckline – I really wish I’d thinned them out significantly. It’s most noticeable how wide they are when viewing the back. If I’d chosen the tie back option this might not be so obvious because they’d naturally get a little bunched up and thinned out. I do feel like it’s a bit of a failure. And that’s fine, it happens to us all. You honestly can’t suit everything. And I don’t assume that because some patterns of a designer look nice on you they all will. Plus there’s nothing really wrong with the finished dress so I might see if I can give it away! Mr AR says it looks nice on me though which is always good to hear. And the midi length is modest but sweet and I’m pleased with how neat my knot looks at the front. Plus the print is just what I wanted: Sweet but still serious. The bodice is self-lined and the skirt is lined in anti-static lining. I used a regular 16 inch zip and black bias binding to hem the skirt. Overall I’m glad I tried this pattern again. But I doubt I’ll make another. 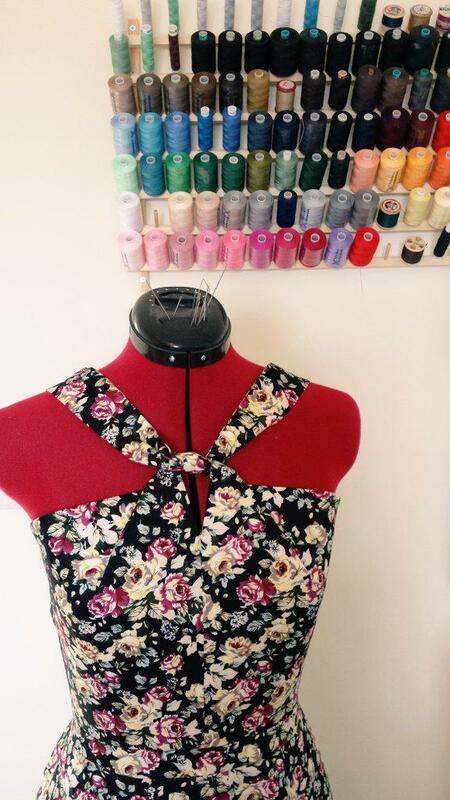 When was the last time you didn’t like a finished garment? Did you keep it or give it away? I’m sorry to hear you don’t like this, as it looks lovely on you. Could you do anything to narrow the straps down, or would it be too much work? I haven’t used the pattern myself so don’t know how they’re constructed. Thanks Sam! If I hadn’t lined it might be able to go back and thin them out. Lesson learned for next time! I think this is really lovely and that it suits you, but I can tell from your little face that you’re not keen! And I know from experience that, even when a project photographs well, it can feel not quite right. So I would say chalk this one up to experience and pass it on to someone who will love it. 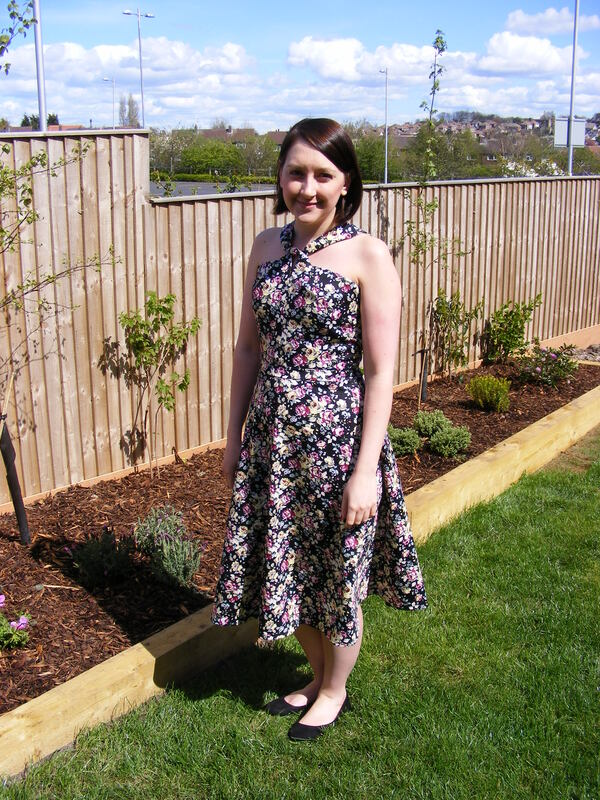 I have given handmade dresses away to friends either because they’re not quite right for me or because they no longer fit, and I have given things to the charity shop as well. Make room in your wardrobe for something you really love! You’re so right… I loaned my traced copy to my mum and she made the CUTEST version with a pencil skirt in rayon. Mega impressed. I’m tempted to just give her the whole dress but maybe I’ll get round to altering it eventually! I am still very grateful you let me borrow and try it. I would have always wondered if it would suit me if you hadn’t helped me out. Aww what a pity you don’t like it. I’d maybe give it a months grace in your wardrobe see if you change your mind, then pass it on if you are still not feeling the love. Hope your next make is a belter. Thanks so much for the kind words. I took it out again the other day and think I’m going to make another one with thinner straps! I think you should leave it in the closet for a month, and then see if you still feel the same way. It does look nice on you; maybe a bit of time away from it will change your feelings? Thanks for the advice. I am coming back around to it. It’s such a pretty neckline, I’m sure I can do something with it! You might consider shortening it to right above the knees. I’ve saved a few dresses, capris and shorts by just changing the length. I’m learning proportions can have a profound effect on whether I will wear something or not. Try holding you hand over the picture to see if you like the dress ending right above your knee, it might be worth a try. I think you’re onto something. I need to whip out my scissors!! I’d definitely give it a few days before deciding, I finished my Emery and hated it at first! Maybe shorten it and see if you prefer it? I think you’re onto something. SNIP SNIP SNIP! Amy I think it looks really lovely on you and the straps don’t look too wide at all. It’s a proper shame you don’t like it! Oh well, you can’t win ’em all…! Thank you! It’s so funny what you see in the mirror doesn’t always match up with how you think a dress is going to look. I would never have thought during construction the straps might be wider than I liked. They look so cute on my mannequin! I love it Amy and it really suits you, the length in particular makes you look taller. I don’t think the neck overwhelms you either. Give a trip out and see what people say – you may be surprised. Thanks for the lovely comments. You should see the version my mum made. Beautiful! You nailed my issue with Sewaholic generally – their patterns are drafted for pears, but I don’t think many of their designs are actually very flattering on pears, which is pretty weird! Anyway the fit and print of this are darling, I hope you get some wear from it anyway. Thank you! I might give it one more chance to redeem itself! There must be something I can do, right? It’s just because it’s lined I’d struggle to get the straps out neatly. Hmmm plotting! I too think the dress is really pretty on you, but on the other hand I understand completely how you feel and if you dont like it on yourself you probably wont wear it? I dont like my walk-away dress!…. 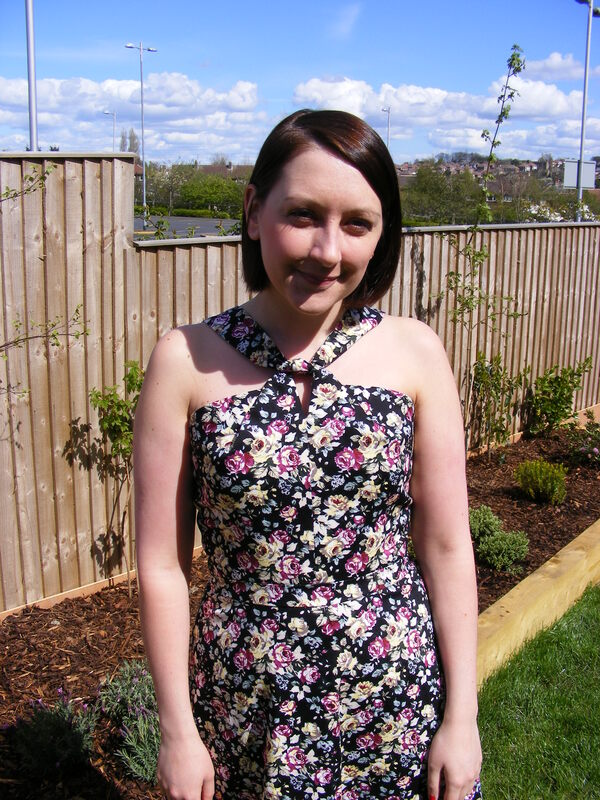 Its off the the charity shop soon or I may chop it up and make a top out of the fabric? You’re onto something Daisy! When you don’t love it maybe it’s best to pass it on to someone else who will. I’m giving it a little longer but if it doesn’t grow on me, definitely off to the charity shop! Oh there are some interesting ideas here on how to save a project! I totally get how you feel- you know your style and what you’ll wear even if to others’ eyes it looks good! I really love that fabric pattern.